Moving to the Isle of Man is a truly unique experience. Our friend, Martyn Anderson tells us about his move from London to the Isle of Man. Martyn Anderson describes his new life, living in the Isle of Man. In London I had a steady career in marketing and a steady income, which I eschewed in April of this year when I moved to the Isle of Man. Whilst I loved (and still love) London, a lot of my time was spent trying to keep my head above the constant noise concomitant with living in the Big Smoke, and it’s extremely difficult to leave any form of indelible mark in a pond the size of London. My main motivation in moving to the Isle of Man was to save. For a house. For the future. If you’ve managed to buy a house in London that isn’t in Zone 34 then kudos to you, you’ve got my utmost respect, but most of the people I know who still live there are renting and will be way into their sixties. I hope I milked London for all it had to offer. If there was a new restaurant opening or a new play in the West End I was there, without fail. Living in London for me was pointless if I didn’t make the most of what London had to offer. Surely I could be living in the back-end of nowhere with significantly cheaper rent if all I was going to do was to stay in and save. So my partner and I made an unconscious decision to take London by the horns and ride the heady waves of hedonism for eight years, paying in excess of £20 for two drinks in a bar and thinking that we’d snagged a bargain. But eight years later, and with nothing to show for my salary apart from a nice Macbook and a decent collection of footwear, we decided to move to the Isle of Man, where my partner is originally from. I hate change. Categorically hate it. But I hate it until it happens, and then I’m its biggest champion. Which is what happened when the subject of relocating to the Isle of Man was raised. Fickle, I know. My partner had been especially nice to me all day, an extremely unusual occurrence that I worryingly wasn’t suspicious of, which in hindsight was a softening tactic for the subject that was about to be broached. It was parceled up with a bottle of wine and the conversational wizardry that my partner is so adept at, making me believe I had made the decision of my own volition when in reality it had been planted in my mind by him, the psychological sorcerer that he is. My prerequisites of moving here was that it would only be short-term, three to five years at the absolute most, so we could move back to London with enough money saved to put down a deposit on a studio apartment in a dodgy area of Zone 34. But two months into living on the Isle of Man I was unabashedly smitten and my five-year restraints had quickly evaporated. I’m here for the long-term and find myself regularly tagging my partner in real estate social media posts (I’m aiming to buy a mini castle on Fort Anne Road that’s on the market for just under £4million, so any donations would be greatly appreciated). People say ‘hello’ to me here. They smile at me in the aisles of Tesco. This is unacceptable behaviour in London that makes me instantly wary, checking my pockets to see if my wallet is still in situ. The first time someone said ‘hi’ to me out the blue here was during a walk in Tholt-y-Will, and my immediate reaction was to tear out his tonsils and demand he return my phone. But seven months on I smile at everyone. I speak to people I don’t know, I regularly say ‘hello’ to fairies and I strike silent deals with a benevolent sea god called Manannán begging him to put his cloak away so that my Sunday morning walk isn’t put on hold; it’s worth noting that I’m very adverse to any form of exercise, so getting annoyed about not being able to shimmy through Archallagan Plantation is a massive step for my cardiovascular and respiratory systems; if anyone’s interested my asthma completely disappeared after three weeks on the island! I’ve also learned how to deal with new emotions that I’m experiencing on the island; namely patience, compassion and empathy, a Holy Trinity that I never had time for in London. You hesitated whilst stepping onto the escalator at Oxford Circus and I shunted you aggressively into your child - your fault, move those trotters quicker! But here, there’s a slower pace of life, and it’s something that took a while for me to adjust to. It’s difficult to feel anger when the beach, mountain and forest are all within minutes’ reach. I’m more proud to call this Island home than some of the ‘Manxies’ I’ve met. The opportunities here (whilst not as frequent or saturated as London’s) are amazing. As a content marketer, words have always been my most inexhaustible source of magic, and my living here has enabled me to become freelance with a steady client base, copywriting all day long. I hate explaining what I do to people. The question gets asked, followed by blank stares and furrowed brows abound. People assume I trademark stuff. The waters of copywriting are murky waters to tread, and it’s an oversaturated, heavily populated career that many people don’t understand. 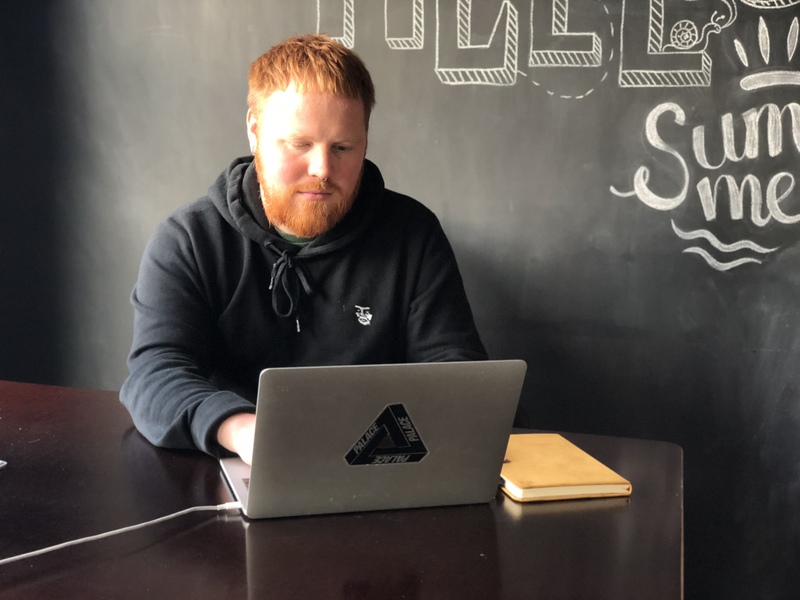 But the Island has provided me with countless quality opportunities to do what I love and make a living out of it, and it’s been the ideal environment to start my own business, Martyn Anderson Copywriting. The current landscape of business marketing is so demanding and onerous that more and more businesses are employing freelance copywriters as means of producing content and copy without the outgoings of a salaried employee, and that’s usually where I’m drafted in. I sometimes feel like I’m living in my own version of The Sims, designing the life that I always wanted before the obstacles of social responsibilities and adult expectations defecated on my dreams, and my partner’s cynicism suspects this is why I love the island as much as I do. This might be true, or at least a determining factor, but it’s difficult to fathom any tangible authenticity whilst I’m still deep in the honeymoon period. Whenever I tell Manxies that I’ve fallen in love and I’m in it for the long haul, the default response is that I’m yet to experience the cold and rain that’s synonymous with a Manx winter, and I shouldn’t make any decisions based purely on the lies told by the TT sunshine we experienced. My response is simple. I’m originally from Manchester. We invented rain and the cold. I’m going nowhere.